i) Must possess a Master’s Degree with 55% and above or its equivalent Degree or Grade of B in the 7 point scale with letter grades O,A,B,C,D,E and F obtained from the Universities recognized in India. i) A regular Principal in Government / Aided / Residential Educational Degree Colleges. ii) 5 years as regular Lecturer in Government / Aided Colleges / Residential Educational Degree Colleges. iv) 10 years as regular Junior Lecturer in Government / Aided Colleges / Residential Junior Colleges. 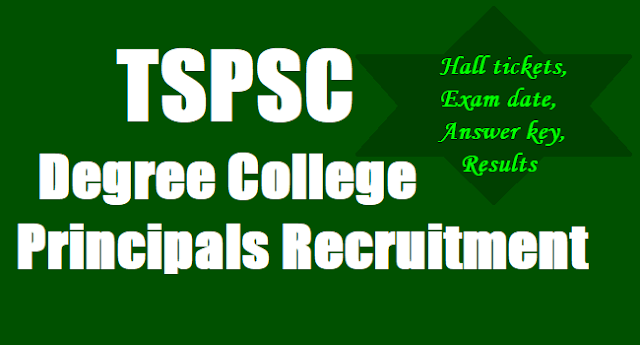 TSPSC has published the Degree College Principals Recruitment 2017 notification on June 1 and online applications are invited from qualified women candidates through the proforma Application to be made available on Commission’s WEBSITE (www.tspsc.gov.in) to the post of Principal Degree College in Residential Degree Colleges (women).